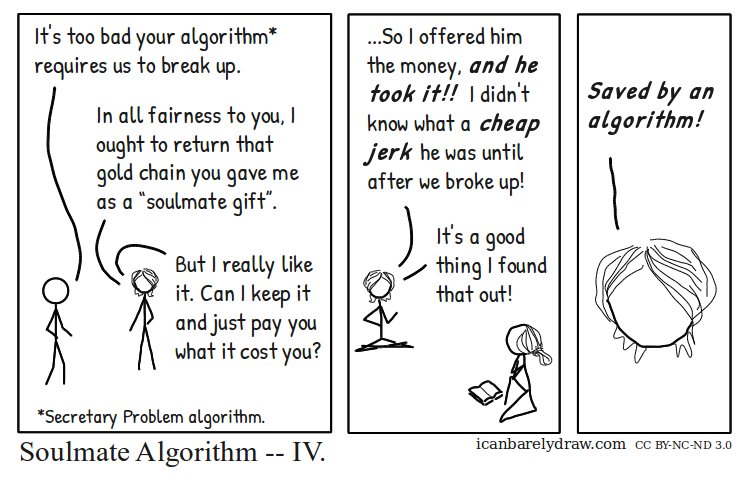 Man: It's too bad your algorithm* requires us to break up. Woman: In all fairness to you, I ought to return that gold chain you gave me as a “soulmate gift”. Woman: But I really like it. Can I keep it and just pay you what it cost you? Woman: ...So I offered him the money, and he took it!! I didn't know what a cheap jerk he was until after we broke up! Woman: It's a good thing I found that out! Woman: Saved by an algorithm! Title: Soulmate Algorithm -- IV.